I love this middle grade spin-off from the Princess Diaries series. I adored the Princess Diaries series too - although I eventually got sick of it. I consider that youngish YA. 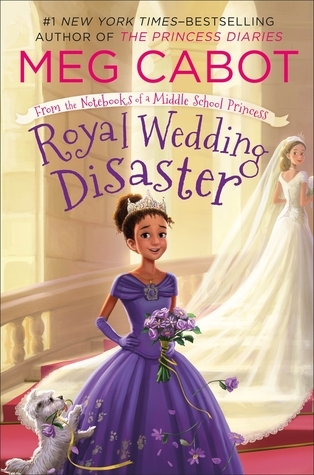 I also really liked The Royal Wedding, a book about Mia all grown up. In a lot of ways I think I like this series even better than The Princess Diaries. I like Olivia more than Mia. Mia was known for her neuroticism, as well as her passion for the environment and other causes. At times she made me nervous to read her, because she was so quirkily anxiety prone. Olivia has a natural confidence and maturity that makes her fun to be around. I think it's because she had to essentially raise herself. Her confidence never comes off of arrogance. She's the type of girl that most people would like, but won't be in the popular group. The plot is your standard middle grade plot. Mean girls, school drama, crazy royal family antics. It's basically the same plot as the first book, but in a different setting. I don't necessarily mind that. I'm reading the book, because I like the Princess Diaries world and I also like Olivia's personality. Meg Cabot runs hot and cold with me. And I can see both aspects in this book. It's inherently pleasing and easy to read. But it also feels a bit cliched. At times, Olivia comes off as too old for a girl of her age and other times as much too naive for a girl of her age. The book relies too much on tropes. That said, I'm reading this because it's fun and not because I have high expectations. So just put those things aside and have a good time! Recommendation: Borrow for all fans of the Princess Diaries. Lots of fan service. I have read the Princess Diaries, but I did enjoy the movie. This one does sound cute, but I have never gotten along with Meg Cabot's books. They are just not for me.